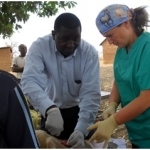 UK volunteers the Faculty of Veterinary Medicine, Sokoine University of Agriculture (Morogoro), from left to right are Tina, Dr.Thomas W. Kahema, Prof.Bittegeko (holding books) and Emily. 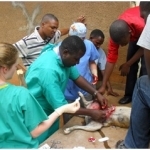 Tanzania Animal Welfare Society (TAWESO) is a non- profit, non-governmental organization registered in Tanzania (00NGO/0492) with a major aim of promoting animal welfare in Tanzania. 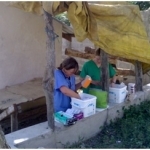 We are a group of people (veterinarians, teachers, members of community, agricultural workers) working currently mainly on volunteer basis. TAWESO is grass root community organization registered on 18th of April, 2008. We are volunteer organization devoted to help animals by fighting against all forms of animal cruelty. 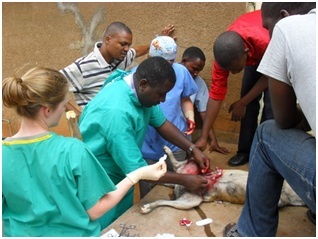 In Tanzania, animal welfare is still not a major priority to many people as they are faced with many other life challenges like street children, extreme poverty and hunger thus the government does not provide financial support to non-profit organizations and therefore our society is working hard in order to improve the welfare of animals in the country, apart from normal routine activities in helping suffering animals in the country, TAWESO runs Dog and Cat Population Control Project in Dar es salaam and Mpwapwa district in Dodoma Region and in the latter area we have a Donkey Welfare Project. 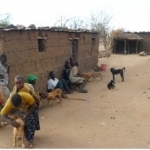 THE PROJECT: The project was conducted in Kihonda, Morogoro and Lupeta ward and some parts of the Mpwapwa Livestock Research &Training Institute in Mpwapwa district, Dodoma region, some 700 kilometres from Dar es salaam. The villages involved were Chang’ombe, Bumila and Lupeta and LITI. 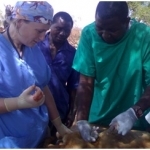 The project was executed by two TAWESO volunteer staff from Dar es salaam (Dr.Thomas W.Kahema and Richard Itaba) and other two volunteer vets from UK (Tina Nurse and Emily Willoughby) who joined with us during implementation of the project. 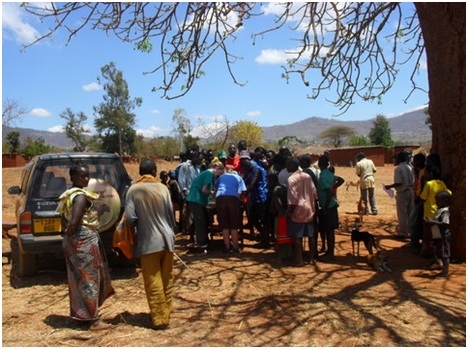 Sterilization theatre under the Baobab tree in Bumila Village, Mpwapwa District. Each morning, we set up our operating theatre under a tree and conducted surgery surrounded by scores of fascinated locals.Not used to close human contact, the dogs resented restraint. 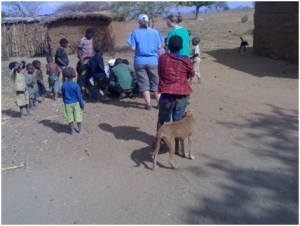 The dog catcher (a previous donation from SNIP International charity in England) was an asset, coupled with Richard Itaba, our extremely capable and experienced Animal Field Officer. Many children walked the distance to our clinics barefoot, presenting their puppies in cradling arms for veterinary attention not usually within their reach. As word spread, the numbers slowly grew. The appreciation was obvious and the need for this kind of care more than necessary. It is not a short-fall in husbandry that prevents these pets from being in tip-top condition. Amenities are difficult to find in the Mpwapwa area. Many dogs were under-nourished and presented with various parasitic infections; especially ticks and mange. Others had Venereal Transmissible Tumour (TVT) disease and we have to excise the tumours coupled with sterilizations. Prophylaxis is not a reality. The project was carried out for about two months intermittently as there was a national election from the months of October and November 2010. A total of 51 dogs were sterilized (20 spays and 31 castrations) and 6 cats were neutered and 4 were spayed. 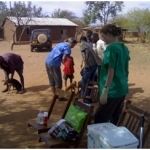 198 dogs and 18 cats were vaccinated against rabies and dewormed. 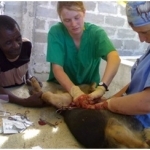 The project was supported from Animal SOS Denmark and other kind donations. 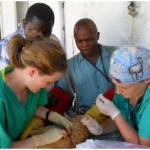 Kind Regards Tanzania Animal Welfare Team.